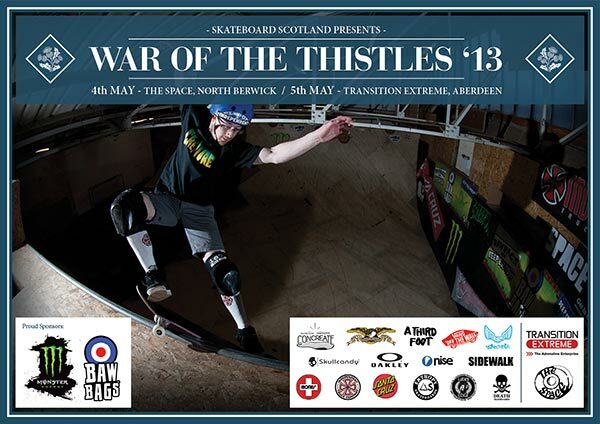 War of the Thistles 2013 will soon be upon us so make sure you have the weekend of the 4th and 5th of May free in your diary to get along to The Space in North Berwick and Transition in Aberdeen for another two days of mayhem. This will be the first year that we’ve used The Space as a venue and it will be interesting to see a bit of vert action getting into the mix, on top of that there is the addition of a new street section complete with freshly poured concrete so Saturday should be insane. Transition has been a regular venue for WOTT the last few years and we’re stoked to be back there again for another Sunday of crazy street, mini ramp and bowl chaos! Entrance fees will be £10 each day, competition sessions will start from 2pm. Is it for all ages ?